The Pastificio Cerere Foundation is pleased to present a personal exhibition by Pietro Ruffo, entitled I sei traditori della libertà. 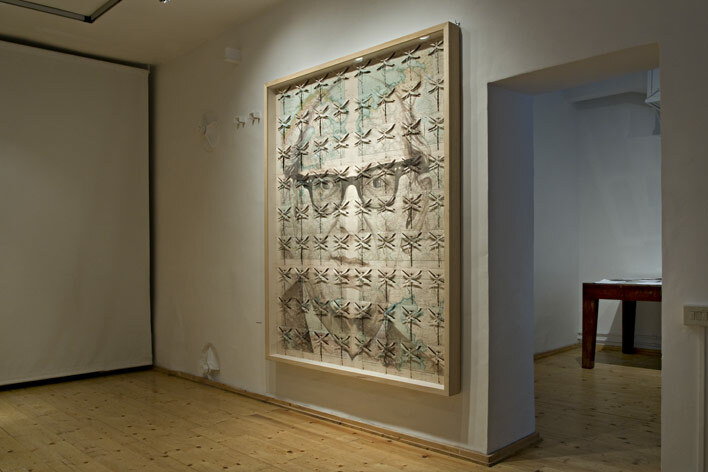 The show represents the final step in the artist’s research on the figure of Isaiah Berlin and his concepts of positive and negative freedom elaborated in the text "Two concepts of liberty" in 1958. Taking as his starting point the six lectures given by Berlin in 1952 for the BBC, in which the Russian-born British philosopher traces six portraits of modern philosophers of the period of the French Revolution, Ruffo arrives to our age, presenting the reflections of six contemporary luminaries on the concepts of negative and positive freedom (prof. Giacomo Marramao, prof. Sebastiano Maffettone, prof. Giovanni Aldobrandini, prof. Eugenio Lecaldano, prof. Ian Carter, prof. Marco Santambrogio). These contemporary philosophers also try to elaborate a new concept of freedom for contemporary society. The exposition is structured as a gallery of six large portraits of the old enemies of freedom, realized with pencil and carved paper that present a spread of dragonflies covering the six faces. The horizontal flight of the dragonflies and the fragility of their existence is symbolic of philosophical, political and social freedom. The six interviews made by Pietro Ruffo with the contemporary philosophers are an integral part of the work because they are displayed as video portraits. Through this creative reflection, the artist hopes to contribute to political and social analysis, investigating the reasons for the failures of the liberal models of the past and suggesting alternative paths for the future.